Tailings ponds are massive earth structures used to store coarse and fine solids contained in the oil sands deposit and recover water back to the main processing plant. These ponds are temporary storage facilities and need to be reclaimed when no longer in use. Fine solids from tailings streams tend to trap large volumes of water, making pond reclamation challenging at best. Mined oil sands typically contains about 8 to 13% bitumen. The remainder is mostly silica sand (up to 60%), fine solids (less than 30%) and no more than 5% water. As the ore is processed through the Bitumen Production facility, large volumes of process water are added to produce a slurry that can be gravity separated, recovering the bitumen and leaving behind coarse sand, fines and process water. This tailings stream is diverted to a storage facility where the solids settle over time, allowing the water to be reclaimed. These tailings ponds need to be massive structures, since they must provide sufficient residence time for water recovery and adequate holding capacity for all the solids contained in the mined ore.
Tailings ponds (or tailings storage facilities) play a critical role in storing solids from mined oil sands and managing water flows. These ponds are massive earth structures, initially constructed from overburden hauled from the mine site. Tailings ponds are normally located in a part of the lease that has little or no bitumen. Tailings produced in Extraction and Froth Treatment normally contain about 50% water. These tailings streams are pumped out to the tailings pond, where the solids settle to the bottom of the pond and clarified water is pumped back to the main processing plant. This reclaimed water provides over 80% of the facility's process water needs. Coarse tailings streams (predominantly underflow of the Primary Separation Cell) are used to build up the sides of the tailings dyke. As more tailings gets deposited, the water level rises and the tailings dam gets higher and higher. Water must continually be pumped out of the pond in order to prevent the water level from getting too high. 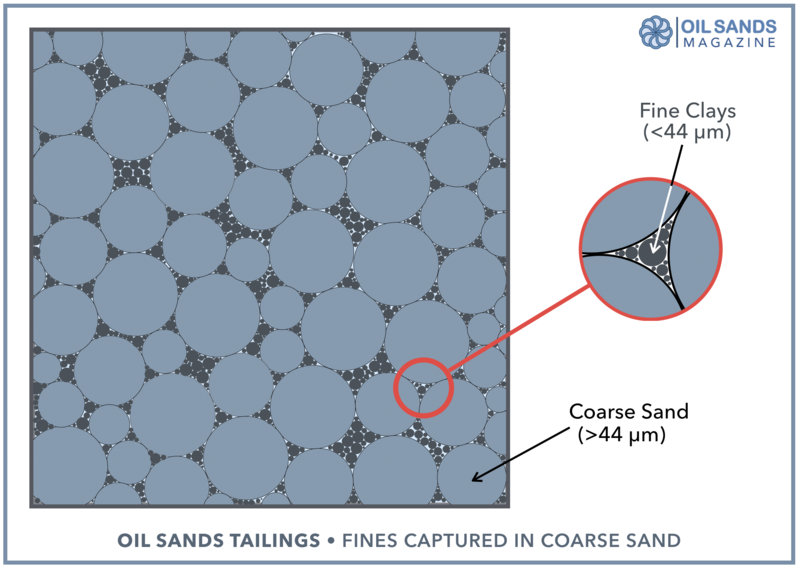 The oil sands deposit naturally contains a significant amount of fines, ranging from 10-30% depending on the deposit geology. Fines are defined as solid particles with diameters less than 44 microns and are comprised mostly of clay and silt material. As tailings are poured into the pond, coarse sand sinks to the bottom, trapping up to 30% of the fines. These fines are trapped within the voids of the coarse tailings stream, which is mostly silica sand. This mixture of coarse silica sand and fines settles easily and has good shear strength, making this material ideal for the construction of beaches and dykes. The remaining fines are suspended in the tailings pond water and have a tendency to form a sludge-like substance termed fine fluid tailings (FFT). If left unprocessed for several years, this layer of fines eventually degrades into mature fine tailings (MFT). MFT traps up to 30% water by volume and is very difficult to dewater. If left untreated, it is estimated that MFT can take up to 150 years to fully dewater and settle out. 40-50% to Fine Tailings: mostly flotation tailings from Extraction but can also include cyclone overflow. 10-30% to Coarse Tailings: mostly underflow from the Primary Separation Cell but can also include cyclone underflow. 10-15% to Froth Treatment Tailings: includes all fines contained in the Extraction bitumen froth. Up to 1% reports to the final bitumen product, depending on the process. Water reclaimed from the tailings pond is over 99% water with up to 1% fine solids and trace amounts of hydrocarbons. The solids are generally composed of very fine clays that do not settle easily in the tailings pond. Tailings pond water is recycled for use as process water throughout the bitumen extraction plant. Depending on the age of the tailings pond and salt content of the mined oil sands, this water can also contain a significant concentration of calcium, magnesium or chloride ions, which can be detrimental to the process and accelerate corrosion rates. Tailings ponds are lined with compacted sand and a layer of fine clay. The clay has a low permeability rate which helps prevent tailings water from seeping into the groundwater. Vertical pumping wells are installed around the perimeter of the tailings dyke (or dam). These wells serve to monitor the quality of the groundwater and any seepage that occurs underneath the dyke. All seepage water and contaminated perimeter water (from rain or melting snow) is pumped back into the process. Pond operators are required by law to keep several meters of freeboard (defined as the difference between the level of the water and the top of the dyke), typically at least 3 meters. 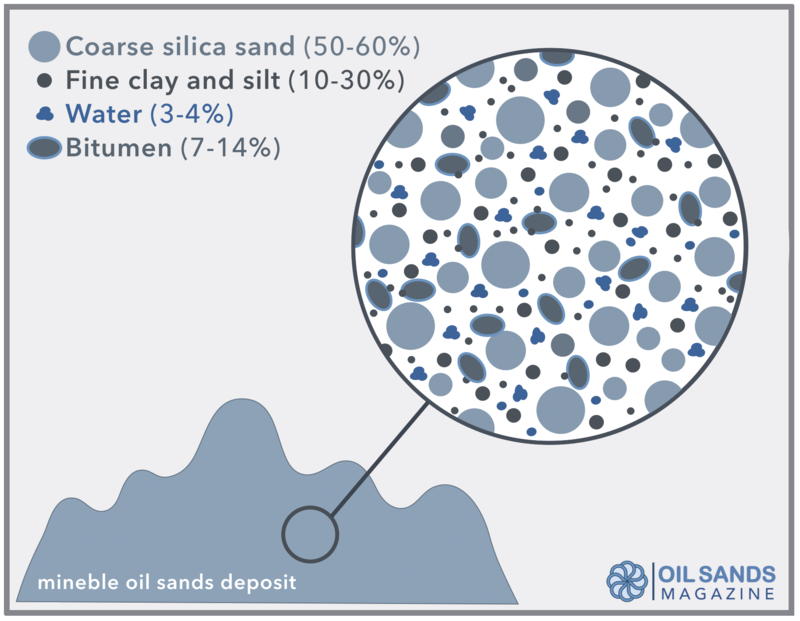 Since tailings ponds have a very large footprint, this ensures more than enough holding capacity in the unlikely event of extended heavy rain storms. It is therefore impossible for a tailings pond to overflow back to the environment. The Alberta government considers all tailings ponds to be temporary storage facilities. Operators regularly report the tailings volumes held in the storage ponds. By law, all ponds must be reclaimed once the pond is no longer in use. In 2008, the Alberta Energy Regulator (AER) enacted Directive 074, banning the long term storage of fine tailings. Operators were to reclaim fines within 1 year of deposition and fully reclaim the area within 5 years. Directive 074 was abandoned in 2015 when it was clear most operators would not be able to meet its targets. Directive 074 was replaced with Directive 085 in early 2016. RECLAMATION DEFINED: Reclamation is defined as the restoration of land back to a "trafficable" landscape that can sustain wildlife and vegetation. The term trafficable refers to soil that has a shear strength of at least 5 kPa, deemed high enough to sustain weight (such as people and vehicles) without sinking. The key to reclaiming tailings ponds is fines management. Slow-settling fines turn to sludge over time and have little shear strength. Accumulation of fines over time is the reason why reclamation has been so slow in the oil sands. Some operators have focused their attention on fines capture, where the fines are trapped within the voids of the coarse solids. Others have chosen the separate out the fines and employ accelerated drying techniques using chemicals or mechanical equipment. Regardless of the technique employed, the desired result is always the same - produce a trafficable landscape that can returned to a more natural state. Directive 074 has since been replaced by Directive 085: Fluid Tailings Management for Oil Sands Mining Projects. Directive 085 has extended reclamation the timeline from 5 to 10 years.